Have you ever been on an epic road trip? I have, and I’ve loved every one of them. The planning, the adventure, the learning – it’s exciting, scary, and humbling all at the same time. Evaluation is no different. Just like a road trip, evaluation gives you new stories to tell, new memories to share, and a new perspective on what’s important. Life is never the same after a road trip… or an evaluation. Evaluation is one of those things you either absolutely love or hate. Please don’t hate me, but I’m definitely in the “love evaluation” camp. I know that most of you probably aren’t in that camp with me, in fact, you probably wish that my camp didn’t exist at all. But, what if I could make evaluation easier for you? What if I could tell you the exact steps you needed to take to evaluate any program? I bet you’d like me then! Well, stay tuned because that’s exactly what I’m going to do. More and more funders are incorporating evaluation into their grant applications. They not only want to hear about what your program or initiative is doing well, but why it’s important and what it means for your participants, your organization, and your community. They want evidence that your program is doing what it was meant to do and that it’s having an impact. That’s what evaluation is all about. Evaluation is a broad term that refers to the collection and analysis of activities, characteristics, and outcomes to make decisions about a program, improve program effectiveness, and inform future programming. Cultivate transparency and accountability with funders and clients. Ultimately, evaluation can demonstrate your awesomeness to the entire world. Don’t worry though, your mom and I will always be in your corner. When Should You Start An Evaluation? If you shouted, “I know this one! At the beginning of the program!” you would be right. Evaluation works best if you start the process right at the beginning of your new program or initiative. This is why evaluation is increasingly becoming part of grant applications, because it’s also part of program planning. At GrantsEdge, we like to think of evaluation as a road trip. It takes a lot of planning to get there, you’re constantly stopping, asking for directions, and wondering, “are we there yet?” But, in the end, the destination is always worth the journey. We’ve heard over and over again that evaluation feels overwhelming, so we want to provide some specific direction for you as you begin to think about how to evaluate your programs and incorporate evaluation into future grant applications. Buckle up! Here are the six stages of The Definitive Road Map To Evaluation. I’m not one of those people who like to travel to a new city or new country and just “wing it.” I want to plan out where I’m going to stay, what I’m going to see, and what I’m going to do. Evaluation is the same. Stage 1 is all about planning your evaluation. What do you want to evaluate? What is the purpose of the evaluation? How will you gather your information? What do you want to know? What will you do with the results once you get them? It’s important to sit down and ask yourself and your team members these questions to really understand what you want to get out of the evaluation process. Need ideas for other questions you should be asking? Check out our Getting Started With Evaluation Guide here. Once I’ve selected all the “must-sees” and “must-dos” on my trip, I map out the best route to make sure I can fit them all into my schedule. Objectives – What the program seeks to achieve or accomplish. Outcomes – The difference the program will make in the lives of individuals, families, organization, or the community. Inputs – The materials and resources the program uses in its activities or processes to serve clients. Outputs – The units of service regarding your program, for example, the number of clients trained, counselled, housed, etc. Success Indicators – The observed and measurable milestones toward an outcome. Here we go! Finally, it’s time to get in the car or board the plane and begin our travels! In evaluation, it means it’s time to start the data collection process. Who do you want to collect data from? Program participants, partner organizations, volunteers, etc. What information do you want to collect? Design those questions! Where will you collect data? Leave a survey at the front desk, interview participants during the program, etc. When will you collect data? Outline the time frame for data collection. Why are you collecting this information? Don’t remember? Go back to your evaluation plan! How will you collect data? You can use surveys, phone interviews, focus groups… whatever makes the most sense for your program and the type of information you want to collect. Once you have that all figured out, go out and collect that data! This is my favourite part. I’m exploring the new city I’m in and learning new things. I don’t understand the language, I’m getting lost, and it’s confusing. But then something magical happens, I recognize the route back to the hotel, I understand some new words, and I really settle in and enjoy this new place. In evaluation, Stage 4 is the data analysis process. If you’ve collected quantitative data, analyze it using descriptive statistics like frequencies, total numbers, percentages, averages, ratios, etc. Put these numbers into tables, charts, and graphs to make them really clear. If you’ve collected qualitative data, provide direct quotes and/or a summary of the common themes that came out in each question. 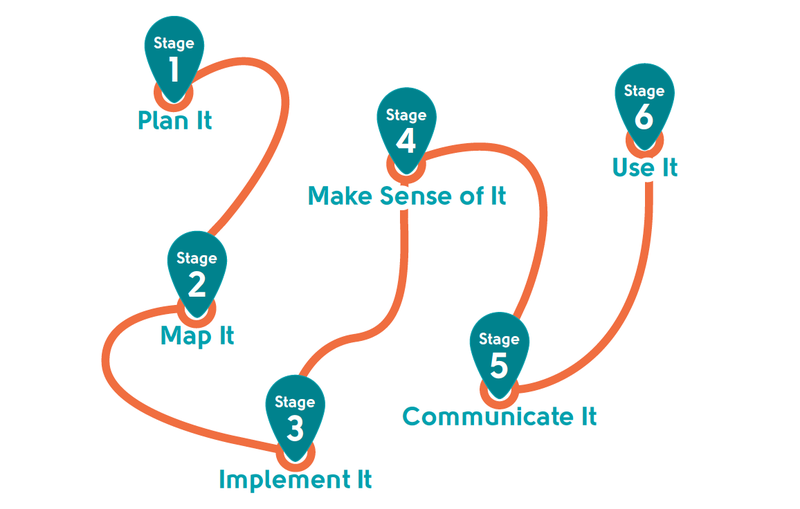 Stage 4 is also about linking the data back to the outcomes and indicators in your evaluation plan. Don’t just present your findings, try to make sense of the data and really understand what your respondents are telling you. You need to understand the story your data is telling you. This is where you’ll see the impact of your results. Am I the only one that still sends postcards when I’m on vacation? I just can’t wait to tell my family and friends about my trip! You’ve put all this work into designing and conducting an evaluation. The next step is to share the results. With whom do you want to share your results? Just staff members and volunteers? The whole community? Don’t forget your funder! They’ll definitely want to know how the program they’ve contributed to is doing. Also think about how you will present the results. On social media? In a presentation at the next staff meeting? In a fully designed report? Remember, the format should match the audience. So, the journey is coming to an end. I like to reflect and ask myself, what was the best part? The most amazing thing I saw? The best food I ate? What didn’t go so well? What would I do differently if I went there again? Once the evaluation is complete, take some time to reflect on how the process went. What went well? What could be enhanced or improved for future evaluations? Think about how you will use this new information. Don’t be the organization that spends all that time doing an evaluation and then never uses the results. Remember why you set out to do the evaluation in the first place. The Road Trip Isn’t Over… It’s Just Beginning! Evaluation is critical to be able to demonstrate impact. Since funders are increasingly requiring their applicants to provide evidence of impact, consider building evaluation into your next new program so you can easily measure your impact and share the significance of your program for your participants, your organization, and your community. Evaluation is a big part of what we do at Kovacs Group. We’ll be sharing much more about evaluation in the upcoming weeks and months on the GrantsEdge Blog! But wait, the journey isn’t over yet! Download our Getting Started With Evaluation Guide that outlines all of the questions you need to ask and answer to get started in evaluation. You can download your copy by filling out the information below.